Privacy and safety are key at New Mansion located on the exclusive West Coast at Paynes Bay. 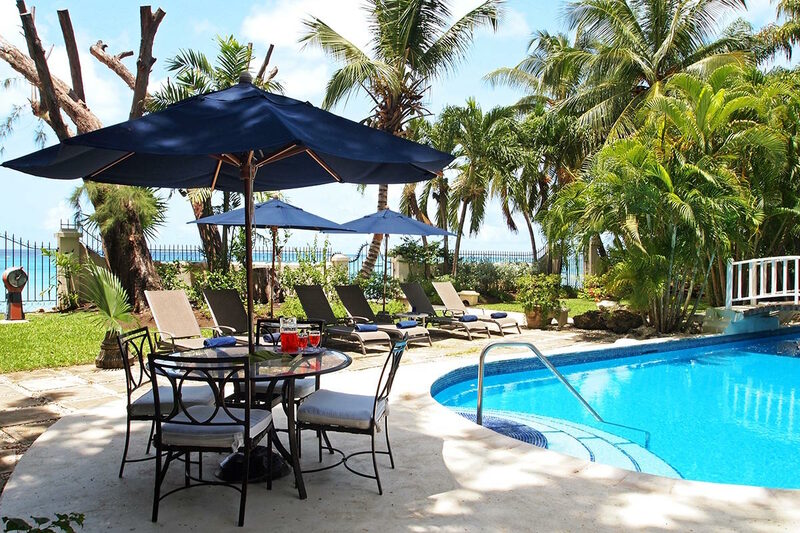 This beachfront villa offers guests four air-conditioned, en-suite bedrooms, a moat-like swimming pool, and all the amenities you could wish for on your holiday to Barbados. The villa is also walled and gated, making it a safe option, especially for those traveling with young children. New Mansion is a modern coral stone villa located beachfront on the exclusive West Coast of Barbados. Privately owned and managed with a personal touch, this villa offers its guests holiday living at its finest. For those who prefer the privacy of their own pool, the owners have completed the gardens with the addition of a moat-like swimming pool, providing peace and tranquility. This villa is complete with all equipment and utilities, and the house is run by a friendly and well-trained staff. The living accommodation is comprised of four air-conditioned bedrooms with en-suite bathrooms, including a large master bedroom with adjoining kitchenette. Views of the pool and beach can be seen from the terrace, which leads out from the master bedroom and adjacent guest bedroom. This is the perfect spot for watching the Caribbean sunsets each evening. In addition, there is a poolside playroom with Hi-Fi equipment and “Direct TV” which is also available in the master bedroom. New Mansion is a short walk along the beach from the prestigious Sandy Lane Hotel. Various restaurants, shops, supermarkets, and banks are also easily accessible. The house lies adjacent to Treasure Beach Hotel, with Tamarind Cove Hotel nearby. Both hotels have good restaurants. Please contact us for Christmas & New Year’s availability and rates. Located on Paynes Bay Beach. Excellent swimming. Our welcome from Sherry, Andrea and Cheryl was warm and the meal they prepared for us was excellent. The highlight for me was the brilliant service provided. The house is in an excellent position and the facilities are first class. We will definitely return here. Were a party of eight adults and when some quiet time was required there were plenty of quiet corners to sit and relax, read a book, do some work or just take forty winks. We had been warned about the hawkers on the beach but we were hardly bothered by them at all. Full use was made of Matthew and his Hobie. Sherry’s cooking was delicious and varied. We had fresh fish most days with fresh salads. The breakfasts were hearty with eggs cooked any way desired along with fruit and toast. The house was kept spotless by Andrea and Cheryl throughout our stay. Andrew was extremely helpful and the experience with WhereToStay was simple and straightforward. Would definitely use them again.